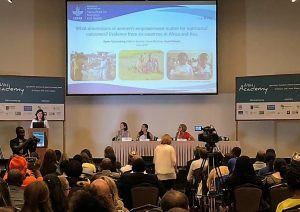 More than 350 scientists from 50 countries met in Accra, Ghana, to advance research in agriculture, nutrition, and health during the third annual Agriculture, Nutrition, and Health (ANH) Academy Week, held June 25 to 29. 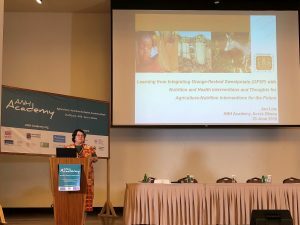 The international conference was organized by the global research network ANH Academy, led by A4NH and the London School of Hygiene and Tropical Medicine’s (LSHTM) IMMANA program (Innovative Methods and Metrics for Agriculture and Nutrition Actions). This year, the Academy Week was held in partnership with the University of Ghana and the African Nutrition Society, alongside others. A Learning Lab on food safety metrics from ILRI’s Silvia Alonso and colleagues. Later in the week, Alonso also presented work she did in partnership with Food Safety flagship leader Delia Grace and others on building food safety capacity in Africa. Following successful meetings in Addis Ababa, Ethiopia, in 2016 and Kathmandu, Nepal, in 2017, the ANH Academy returned to Africa this year, with Ghana chosen as the host in order to bring the conference to a different part of the continent. Video from conference sessions will be available on the ANH Academy website soon.